I bought a box of expensive Medjool dates a while ago to make Ottolenghi's delicious spinach and date salad and then spent ages trying to figure out what to do with the remainder. Don't you hate it when that happens? 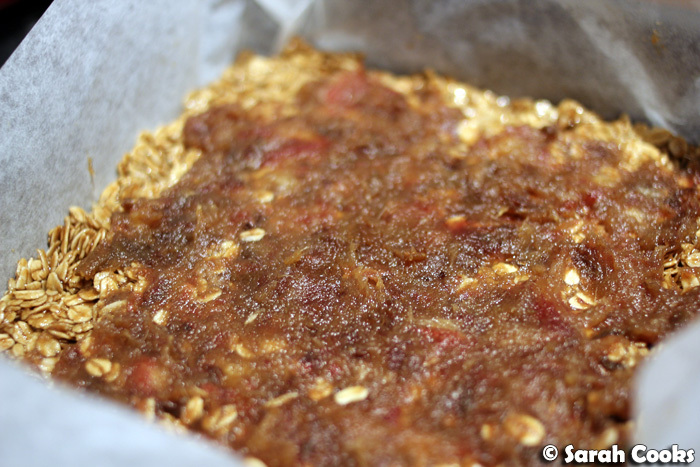 Well, one morning I made myself a bowl of porridge and added brown sugar and chopped dates for sweetness - I liked the combo so much that I decided to use the same flavours and bake a really intense, oaty, buttery flapjack with a layer of date caramel on the inside. And I am so glad I did! My first impulse when it comes to baking is to reach for a Nigella book, but I vaguely remembered reading reports that her flapjacks were hard to flip and broke apart easily. 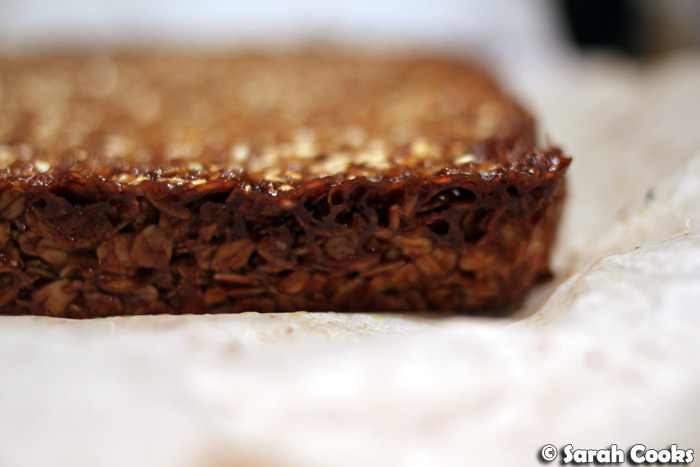 And when I googled "flapjack", the amount of recipes that came up were astounding, with each author having their own tips on avoiding breakage, and Very Strong Opinions on the characteristics that make a good flapjack: crisp, soft, thick, thin, sweet, spiced...? 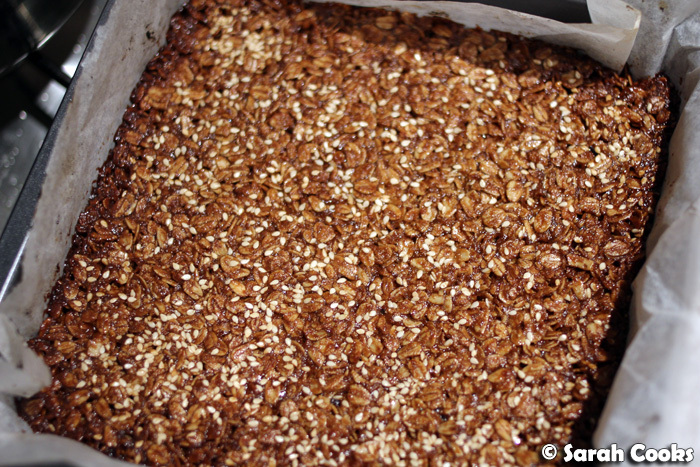 What was common, however, was the holy quadrilogy of flapjack ingredients: oats, golden syrup, brown sugar, and butter. 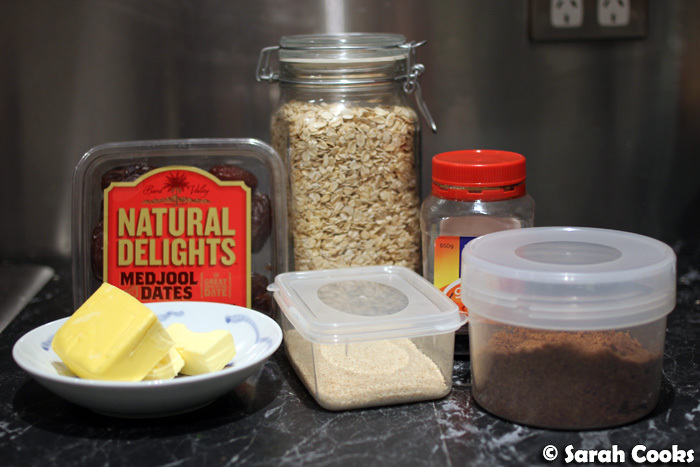 For the oaty base, I took a rough average of the dozens of varying recipes I found online. I also (obviously) added a layer of date caramel, a good pinch of salt to balance out the sweetness, and also took Nigella's tip of sprinkling sesame seeds over the top. Now: don't be fooled. 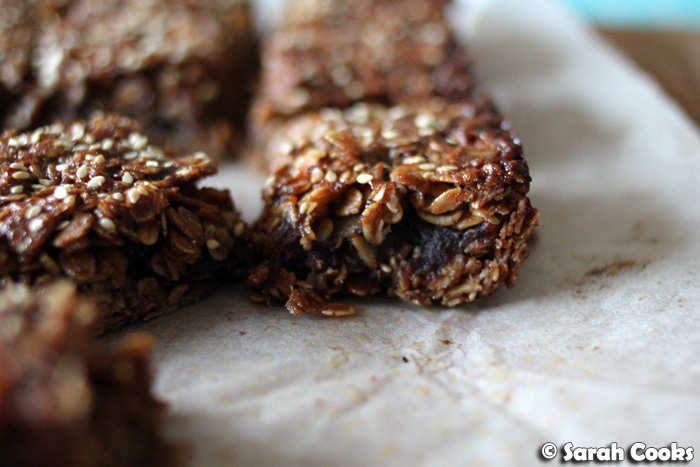 The inclusion of oats does not make this a healthy treat! 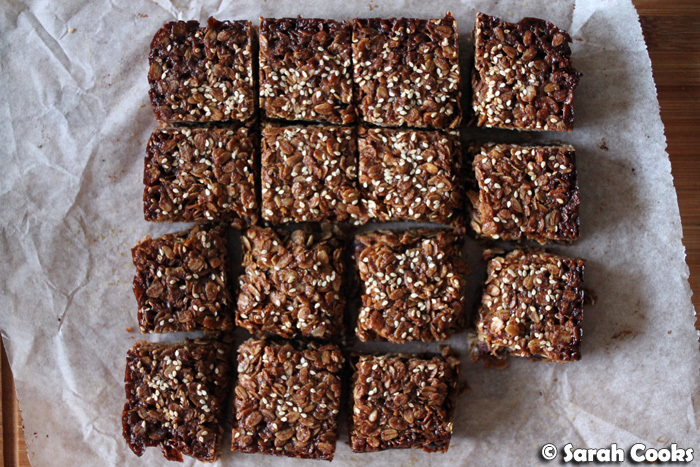 With 150 grams of butter and 150 grams of brown sugar to 300 grams of oats (not to mention the golden syrup and date caramel), this is a seriously decadent treat. Think of the oats not as a healthy base, but rather as an efficient delivery system for the sugar and butter, much like a spoon or an IV drip. Ahem. To make date caramel, you simply simmer pitted dates in a little water for five minutes, then blend them up in a food processor to make a sticky paste. Incidentally, date caramel is touted all over the place as a "healthy" and "natural" alternative to regular caramel, which is an image I totally don't get. Dates, like any dried fruit, are very high in sugar (67% according to this website), so I don't think it would be that much better for you than regular caramel. Basically, what I'm saying is - don't eat it to be "healthy", eat it if you like the taste! Check out the oats, all slicked with melted butter and brown sugar. Love! I only used 100 grams of dates, which makes a nice thin layer and stops the finished product from being too sweet - but it's easy enough to scale the recipe up if you'd want more. And here it is, baked! I must admit I felt quite an unhealthy amount of glee watching the buttery sugar bubbling up and caramelizing on the sides as it baked. 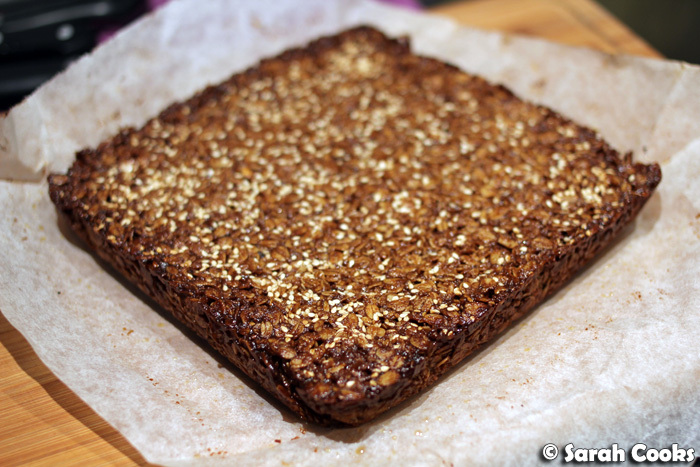 I found that the flapjacks were much easier to slice the next day, once it had cooled completely, but they taste so fantastic warm from the oven! I'd definitely suggest cutting off a few pieces whilst still warm and inhaling it alongside a cup of tea. 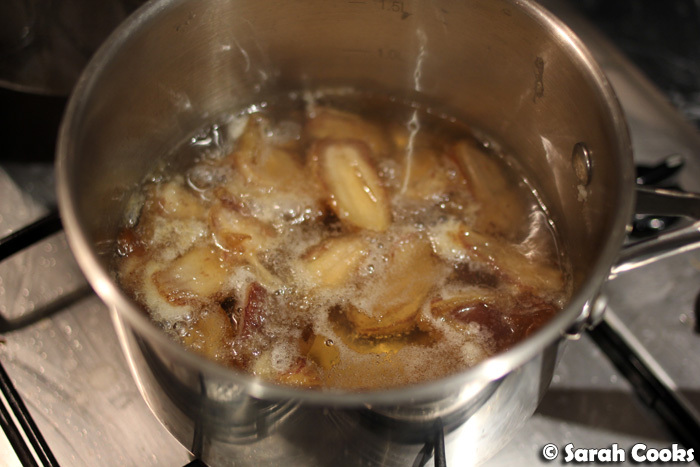 Roughly chop the dates and place in a small saucepan with the bicarb. Pour over just enough water to cover and simmer for five minutes. Drain the dates, reserving the liquid. Place the dates in a food processor or blender, and whizz to combine. Add 1-2 tablespoons of the cooking water and whizz to make a rough purée. Preheat the oven to 160C and line a 20cm square cake tin with baking paper. Melt the butter, sugar and golden syrup in a medium saucepan and stir to combine. 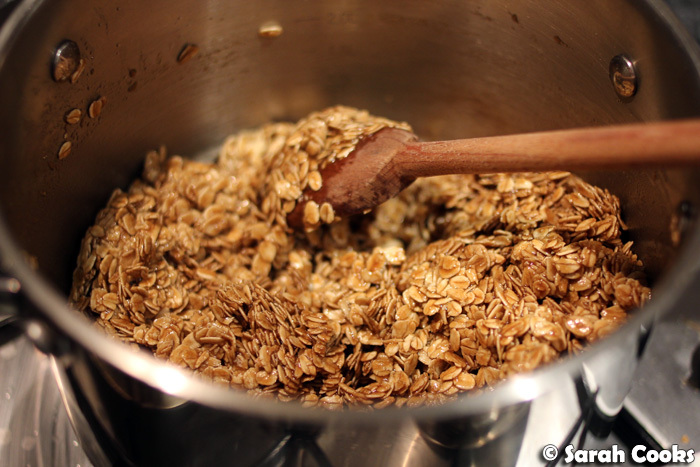 Take off the heat and stir in the oats and salt. Spread half the mixture into the tin, in as even a layer as you can manage. Spread the date caramel over. There won't be a lot of caramel and the uncooked flapjack base isn't sturdy enough to withstand vigorous spreading (*ahem*), so the best way to do this is to dollop spoonfuls of the caramel over the base, then wet your fingers and spread the caramel out as best you can, leaving a 1-cm border. 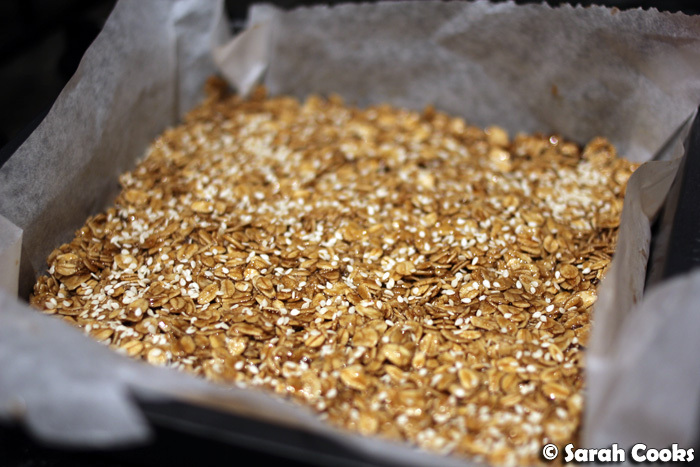 Spoon the remaining oat mixture over and spread / pat it out to an even layer. Sprinkle sesame seeds over. Bake for 40 minutes or until golden brown and bubbling. Allow to cool before transferring to a chopping board and cutting into fat slabs. 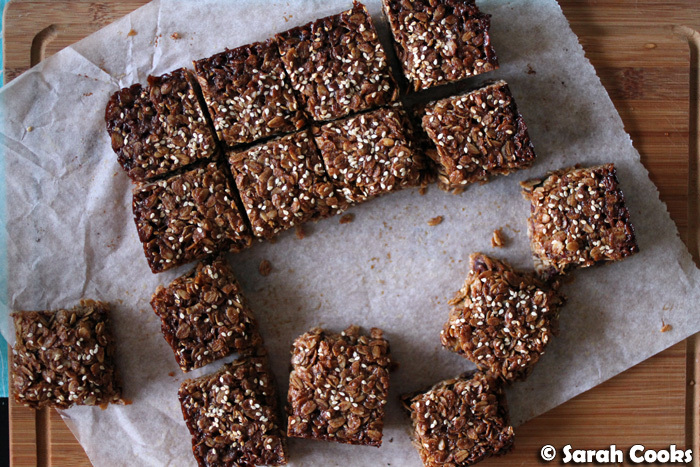 Like Lorraine I don't think I've had proper flapjacks before :) I've always heard about them and just thought of them as muesli bars but these look so much more delicious! 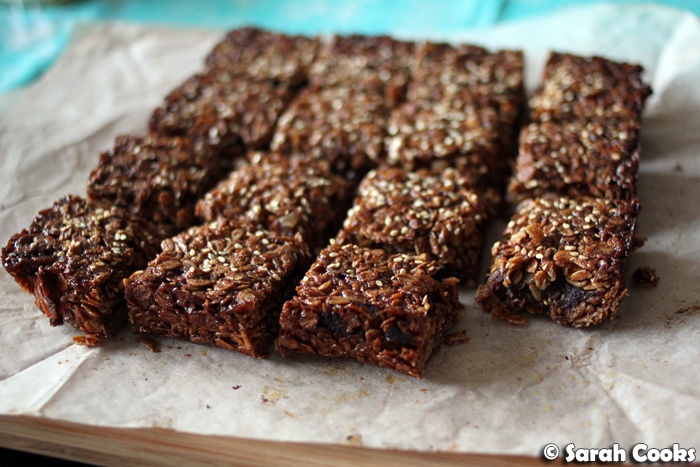 Mmm, these do sound like the perfect treat with a cup of tea! Never really heard of date caramel before, but it does sound good!